Fast responsive performance all round. Load impact performed well consistently. Downtimes aren't a concern. Servers are stable enough to run a fairly robust site. Support is very efficient, and live chat is fast, but ticket replies can be slow. Very affordable to get started, but renewals are a bit more pricey. Launching a quality website is crucial for any business, no matter how large or how small. But, before you can even think about launching your site, you’ll need a Canadian web host that you can trust. Web hosting companies offer remote servers where you can store your site’s files. Not all Canadian web hosts are the same, though, which is why you’ll want to find the best option that also fits into your budget. You may have heard of the Canadian web hosting company Bluehost, which is one of the longest-tenured and most popular web hosting providers in the world. As you may know Bluehost is the flagship brand of the conglomerate EIG. There are better web hosting providers but if you are interested in Bluehost check out the following review to decide if they are the right choice for you. Your site and your business are unique, which is why you shouldn’t settle for one-size-fits-all hosting. When you choose Bluehost as your web host, you have various options to select from. Here’s a look at those options, including a rundown of the benefits of each. When you’re just getting started, it’s a good idea to prioritize finding a dependable web host that charges low prices. That’s why shared hosting is often the best fit for hosting beginners. All plans feature unlimited bandwidth. 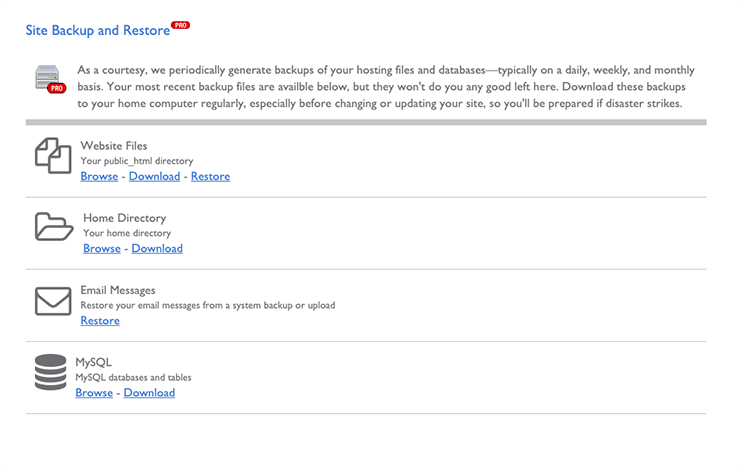 As you upgrade within shared hosting, you get more storage and the ability to host more domains and sites, as well as the ability to create more email addresses. While shared hosting is great for starters, your site is actually sharing a server with others. This can lead to shifting load times and performance, and shared hosting is typically insufficient for sites with high traffic. 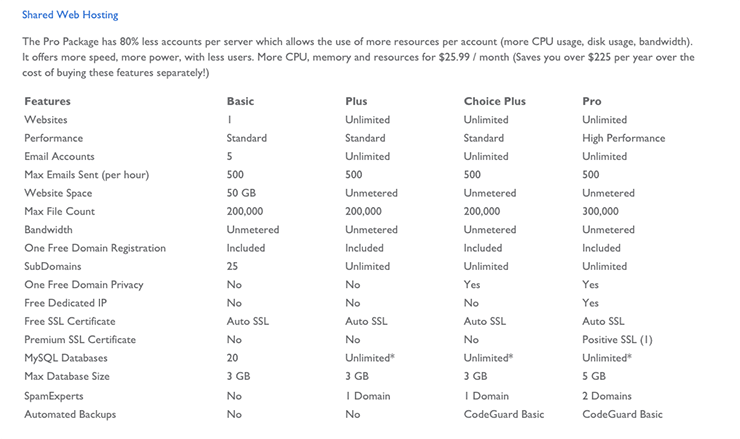 As you move up in tier and cost, you enjoy access to more CPU cores, more storage, greater RAM and more IP addresses. The main disadvantage with VPS hosting is that you pay more than shared hosting but you don’t get control over the hosting environment like you would if you pay just a bit more for dedicated hosting. Moving up through the tiers, you get larger CPUs, more storage and greater RAM. The primary disadvantage of dedicated hosting is the cost. If you don’t have the high traffic or need the control to necessitate dedicated hosting, you can save money by choosing a different type of hosting. As you choose higher tiers of service, you enjoy the ability to accommodate more monthly visitors as well as access to more storage and RAM. The challenge large hosting companies like Bluehost face is providing effective WordPress hosting that competes with the lower prices of companies that focus solely on WordPress hosting. Any web hosting company is going to come with its own unique pros and cons, and Bluehost is no different. If you’re interested in reading a Bluehost review, surely you’re also interested in the advantages and disadvantages. To help you make the best decision for your site and your business, here’s a look Bluehost’s pros and cons. There is a lot to love when you choose Bluehost. Check out the following benefits that this hosting provider helps you unlock. What’s your No. 1 priority when searching for a dependable web host? If you’re like most entrepreneurs and web developers, so-called “up” time is of the utmost importance — and it’s hard to find a hosting provider with better up time than Bluehost. Bluehost is known to post month after month of 100% up time. If and when the service goes down, it remains down for only minutes or even seconds. Read almost any Bluehost review, and you’ll find reviewers praising the service’s stability and reliability. As a global web hosting company, Bluehost is operating in a competitive environment in which speed is essential. The good news: Back in 2017, Bluehost made updates and changes focused on increasing its page-load speed. Today, Bluehost ranks among the top 10 web host providers in speed, offering load times that hover in the low 400s (as measured by milliseconds) and sometimes even less. Without daily backups and restoration options, your website can meet with tragedy. Any good Bluehost review will note that you have the ability to establish daily backups and the option to restore your full site if and when something terrible happens. If you’re going to spend the time, effort, money and energy to build a high-quality website, make sure you’re protecting it via backups — which you’ll have access to when you choose Bluehost. Some web hosting companies offer control panels that are unwieldy and difficult to navigate. That’s not the case when you choose Bluehost. 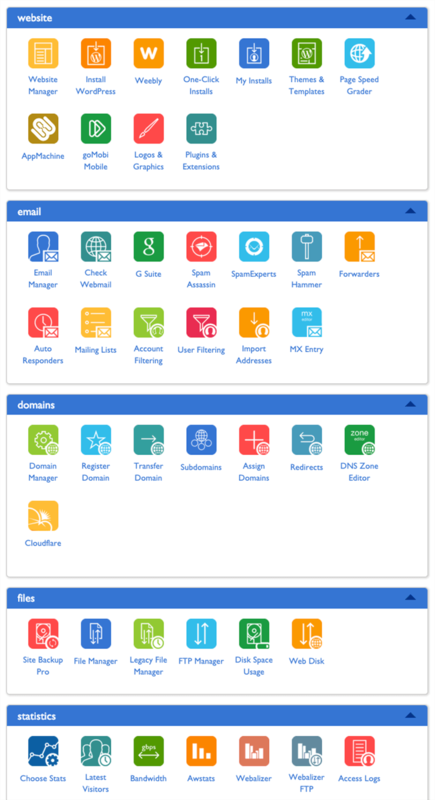 Bluehost offers a cPanel interface that is fast, simple and easy to use, even for beginners. You won’t waste precious time searching for features that you need. Within cPanel, everything you could possibly want for your site is available with the simple click of an icon. 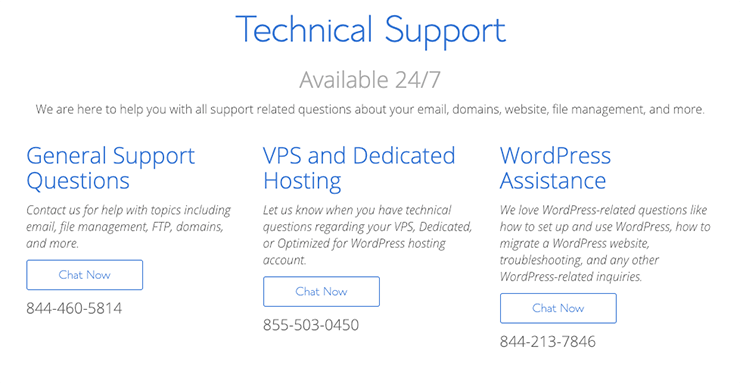 As an added bonus, Bluehost users enjoy access to in-depth support via self-help documentation and how-to videos. Streamline your introduction to hosting control panels when you choose Bluehost. With Bluehost you can start small and upgrade as your site and business grow. It’s hard to determine which hosting package is best when you’re first getting started. Bluehost allows you to begin at an entry level and make changes as needed. All it takes is an online chat or phone call. No hosting company is perfect, which you’ll discover whenever you read a Bluehost review. This company and its services are not infallible, so take a look at the following Bluehost cons — which will allow you to start with eyes wide open should you choose it as your hosting company. Bluehost is renowned for its price increases. Bluehost gets you started at a teaser rate that then leaps up either in the second month or upon renewal in the second year. As you browse through the plans and prices listed above, keep in mind that those are starting prices. The prices are likely to climb in either month or year No. 2. Make sure to read the fine print when you buy Bluehost services. The company is known to have some burdensome usage policies and restrictions. For example, what Bluehost bills as “unlimited” space and storage isn’t necessarily unlimited if you aren’t following usage policies exactly. If you’re interested in Bluehost, it’s best to start with them from the beginning. Why? Because Bluehost charges a fee for site migrations, which is not common throughout the industry. For example, if your site and email are hosted by a competitor, Bluehost will charge you $149.99 for migration, and there’s no guarantee that they will let you migrate all of your sites or email addresses. This isn’t a problem if you’re just getting started, but established sites and businesses may take issue with the migration fees at Bluehost. Yes, Bluehost offers lots of different hosting options, and you can upgrade at any time. That said, you may experience a little bit of sticker shock as you move up the ladder. Remember that the prices listed above are only starting prices and that they are likely to rise in the second month or year. When you upgrade, you may be tempted to pay a full year in advance, at which point your jaw may drop at the overall cost of hosting with Bluehost at higher levels. Bluehost’s live customer support is available via chat and by phone, and you typically have no problem getting through quickly. But customer service representatives don’t always have the knowledge needed to help you. If you get into a frustrating situation with a customer service rep, either online or by phone, simply end the conversation and try again. You are likely to get a far more knowledgeable rep on your next attempt. There’s something nice about enjoying options when searching for a reliable Canadian web host. What you’ll find with Bluehost (that you won’t find with other companies) is a wealth of options — you can pick a plan and tier that perfectly match your site and your business. Not to mention, you can also upgrade and grow your hosting plan as your business grows. Bluehost is one of the most popular hosting options for a reason. You’ll get stability, reliability and speed, and you have options to choose from as your site and its needs shift and evolve. Interested in learning more about Bluehost? Check out plans and pricing for yourself.